Hey everyone, this is Brittany with the latest progress entry. I just returned a few days ago from a family vacation. We were visiting my sister who is in the Air Force. She is stationed in Virginia, so we drove there to spend the week with her. One of my ex-co-workers, Jordan, asked me to make this hat for her. 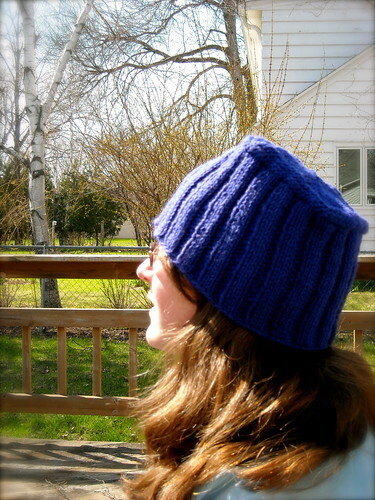 It is pattern 35, the Textured Tam. 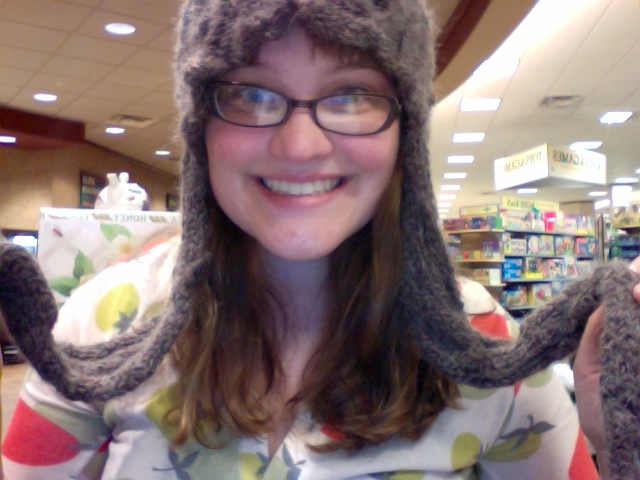 I was quite nervous about making this hat. I have a huge phobia over the L word...aka lace. And although this project didn't have a TON of lace like features, it had some. The cables helped me feel better...since I love cables! 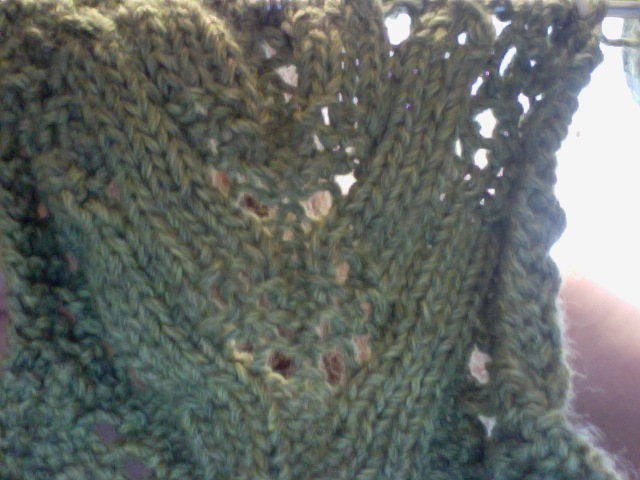 Those yarn overs tend to disappear off of my needles and the entire project just ends up looking like crap. 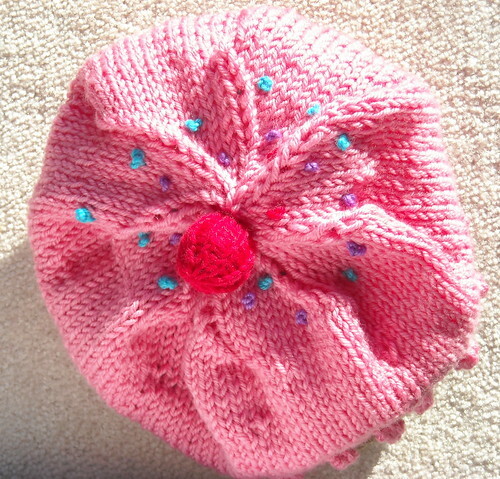 I finished the hat in 2 days flat. 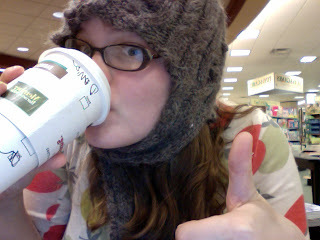 This thing looks like a darn beanie. The pattern is awesome...but it is TOO short. Looking at the pattern it calls for size 7 needles. 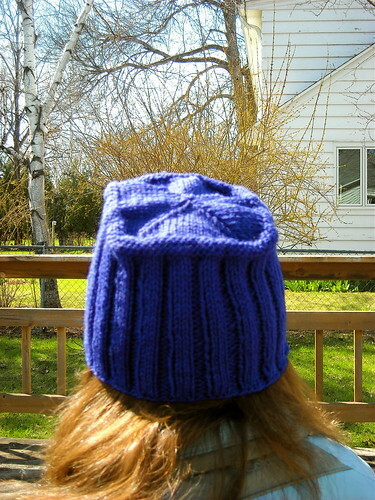 However, in the actual instructions for the hat, it says "with smaller circular needle, cast on 94 sts." Nowhere does it say "with larger needles" indicating that there are no larger needles. Since the pattern only calls for one size of needle, I am suspecting A) the phrase "with smaller circular needle" is incorrect or B) they forgot to add in the other size needle, which I am guessing is a size 8 or 9. There is another possible reason: C) the smaller needles are supposed to be a size 6 (not a size 7) and the larger needles are a size 7. Either way there is some sort of error in the book and I hope Cascade will correct the issue if they see fit. You can find other errata that Brittany and I discovered (as well as, other talented knitters) by clicking here. Well, that's all I have for now! It's Em! I'm in Minnesota right now with the family...Brittany is on vacation with her family in Virginia. Nevertheless both of us are knitting!!! I am so excited. This one has been a long time waiting. I had some issues with this project. 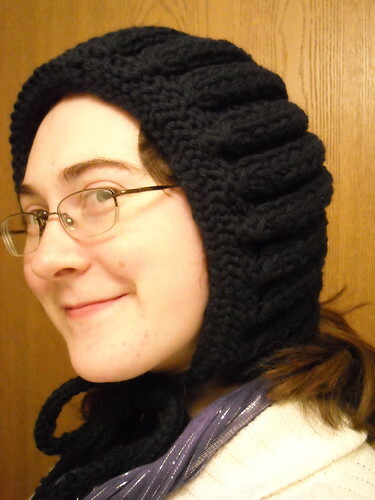 First of all, the pattern calls for size 8 needles for the scarf and then size 6 for the hat. At first I tried using these suggestions. However, after I got about a third into the hat I realized that my gauge was going to be too small if I kept on using this needle. Therefore, I switched to a size 7 needle instead. I was very pleased with the results. 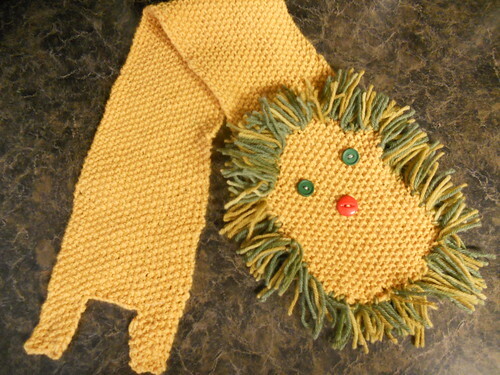 1) Make the scarf part longer. I couldn't get the scarf around my neck because it was too short. Instead of doing 3 repeats, I did 4. It made it long enough so I could actually benefit from using the scarf and hat combo. 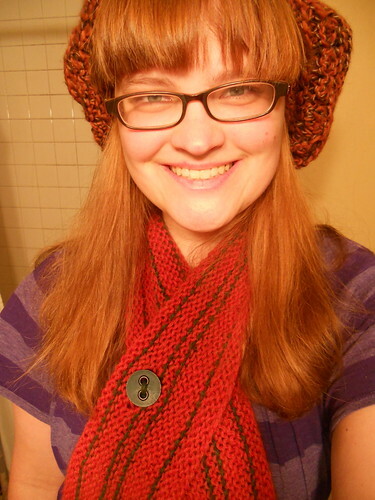 2) Whatever size you use for the scarf, go down ONE size for the hat. Using the same size for the hat will not work. It will be too big for your head. (I tried this too, and that's why part of it sticks out funny in the photo.) Going down one size will take less time, plus it won't look so strange between the scarf and the hat. Also, as I said before, it will fit better. From my research on Ravelry. It seems that most people enjoyed this scarf. 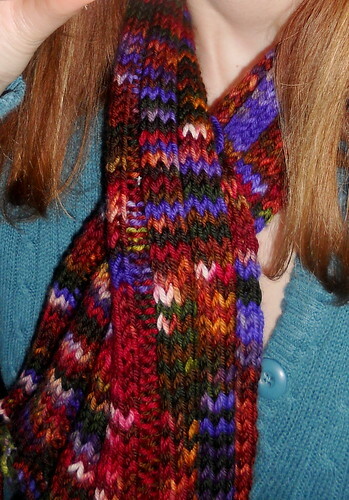 If I could have used better yarn (I used Bernet, not my favorite) I probably would have enjoyed this pattern more too. Also, for the decreased rounds. They have you take a darning needle into 25 stitches. I felt that was too many stitches to tie together with. Therefore, I repeated the last round (p1, ssk) for another 3 rounds so I ended up with only 9(?) stitches. It worked so much better because it gave a few extra mm's to the hat. 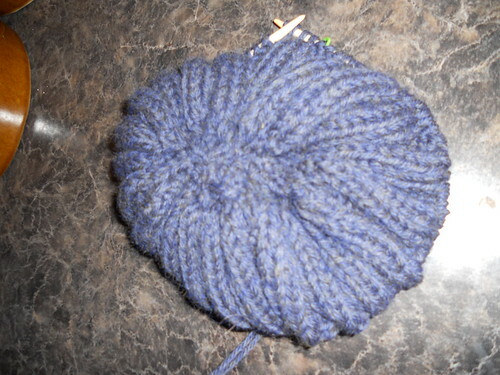 It also was easier to bind off the project. Hey Everybody, it is Em!!! 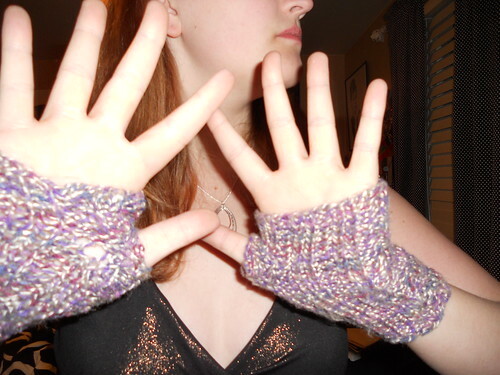 I'm so excited to present you with the finished...Cabled Cuff Mittens! I wanted to show you photos of my other finished project, the Reverse Stockinette Mittens, however my camera is currently MIA. Therefore, I cannot post anything about my new mittens until it is found. 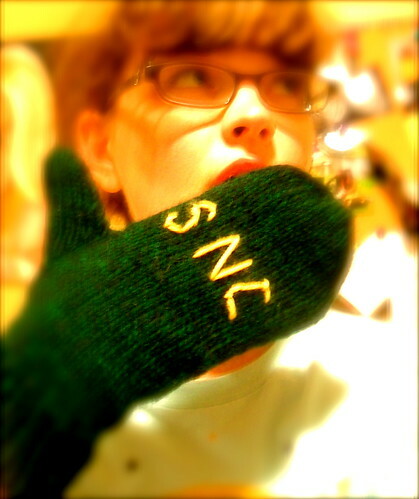 Either way I am very proud of these mittens. They are truly a quick knit. 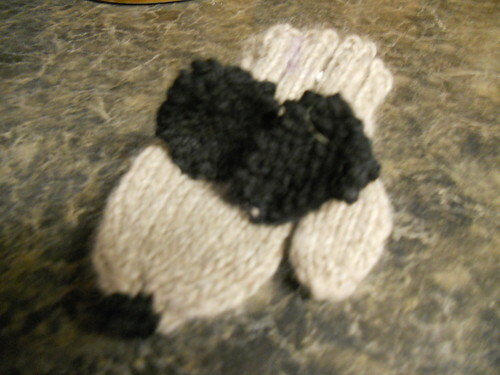 Now, these mittens are at their new home, with my friend Sarah. They are nice and long and fit very nicely on Sarah. They have enough room to stuff an extra layer of mittens or even part of a coat. I want to restate how I really enjoyed this pattern. I didn't find any errors. 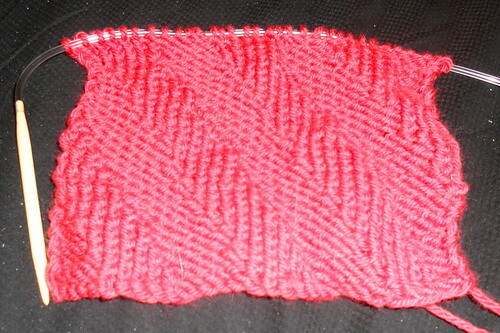 I read, on Raverly, that it is advised to knit a 2-4 rows of st st, before you start the cabling pattern. That way it is easier to graft. I personally didn't find this something important to do. 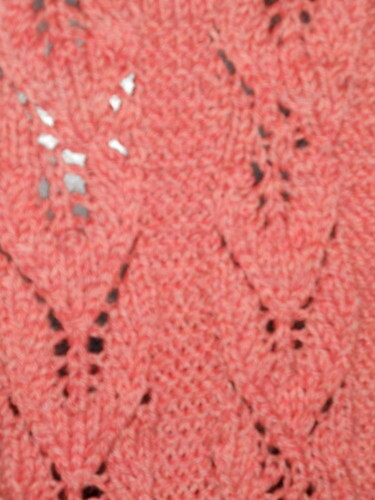 However, if you prefer to have a little bit of material before you start, it is not a bad idea to knit a row or two. I also saw an amazing spin on this pattern. AnnetteTR on Ravelry made her cabled mittens white with blue cabling. It was the coolest version of the mittens ever. I asked AnnetteTR how she did this. Her description was simple. Since I do not know her personally, I do not feel comfortable posting her tips nor her photos on our site. However, please PLEASE look her up and click "love" on her mittens. They are to die for! I wanted to also talk about the art of making thumbs. When I first started making mittens, I always struggled at making the thumbs look convincing. If anything, they looked strange and tacky. I pondered on HOW could I make better thumbs? I didn't really learn the secret of making thumbs look awesome until I started taking some risks. Here is what I discovered about making the thumb look normal. I wished somebody told me this when I was learning about thumbs! 1) Don't fret about holes that are between your thumb and the rest of the mitten. You can always sew them shut. I didn't understand that it was an option to sew something shut. I always spent so much energy trying to pick up stitches that my thumbs looked mutated. Now, I pick up just one or two and sew those shut later. I cut a long tail and use that strand of yarn to weave in ends, as well as, close up the seam. 2) Pick up the correct number of stitches...plus one more. I always pick up one extra stitch than what the pattern calls for. Then I knit those two together. This helps make that picked up stitch stronger. 3) The more you do it, the easier it becomes. In time...your thumbs won't look strange. Mine don't anymore. I hope that helped!!!! 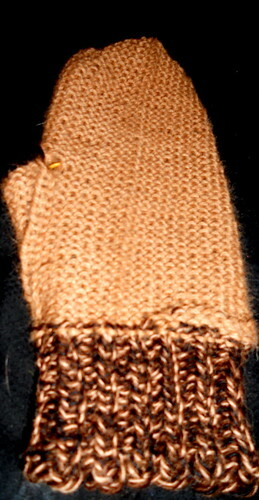 If not, I hope you enjoyed the photos of my newly made mittens! Again, I cannot rave on how awesome this pattern was!!! Hey everyone, this is Brittany with the latest progress entry. I know it has been quite some time since I have posted anything, but I promise I will next week. This is the last week of school for me, which means lots of long days and cleaning projects. This leaves little time for knitting. I am looking forward to getting back to my knitting needles VERY soon.